Netizens had mixed reactions over Dinesh Karthik being selected over Rishabh Pant. However, Robin Uthappa has come out in support of the former, calling him ‘best finisher in the Indian squad’ in the past two years and expressed feeling ‘stoked’ for his selection. Robin wrote, "“If ever a person deserved to be in this world cup squad on merit and his performance it been @dk00019!! STOKED for him!! Justice has been done! Easily the best finisher in the Indian team in the past two years!!" 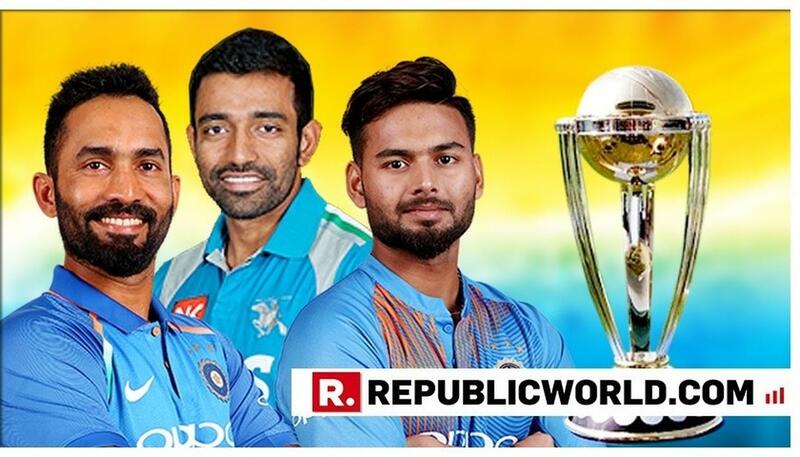 Who deserved the place for the second wicketkeeper in the Indian squad for the World Cup? Netizens had mixed reactions over Dinesh Karthik being selected over Rishabh Pant. However, Robin Uthappa has come out in support of the former, calling him ‘best finisher in the Indian squad’ in the past two years and expressed feeling ‘stoked’ for his selection. Robin and Dinesh have been teammates at various stages of their careers right from U-19 World Cup in 2004 to the Kolkata Knight Riders now and winning the World T20 together in 2007. 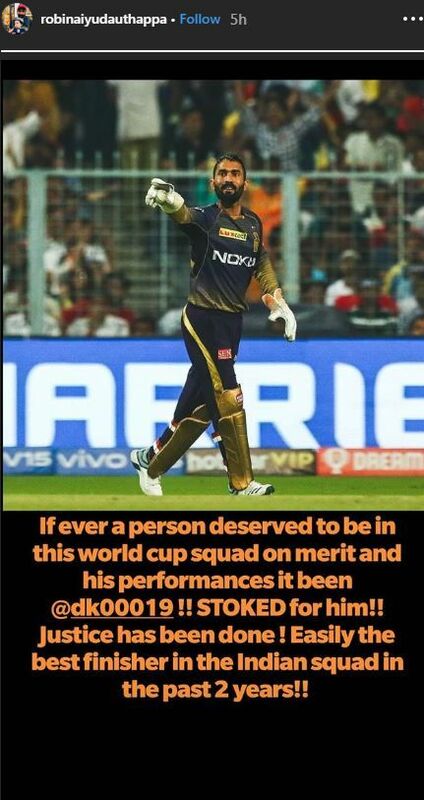 The former came out in support of Dinesh amid those criticising the selectors for their decision and wrote on Instagram stories, “If ever a person deserved to be in this world cup squad on merit and his performance it been @dk00019!! STOKED for him!! Justice has been done! Easily the best finisher in the Indian team in the past two years!!" Earlier, Michael Vaughan, Sanjay Manjrekar and Sunil Gavaskar had expressed surprise over Dinesh's inclusion/Rishabh's omission. Vaughan had tweeted, "No @RishabPant777 in the World Cup Squad ... India must be bonkers !!!!!" Manjrekar wrote, "It’s impossible to keep everyone happy with team selections but Karthik inclusion surprising. Selectors guilty of showing no consistency in his case. Discarded after Jan 2019 to select straight for the WC. Shankar is a lucky man to make it." Sunil Gavaskar in an interview to a channel said that he is surprised about Rishabh's omission due to his current form, but he agreed that Karthik is a better keeper and could come in handy in case Dhoni can't make it to the playing 11. Here's the full list of players departing to England and Wales for the tournament starting on May 30. India will be playing its first match against South Africa on June 5.